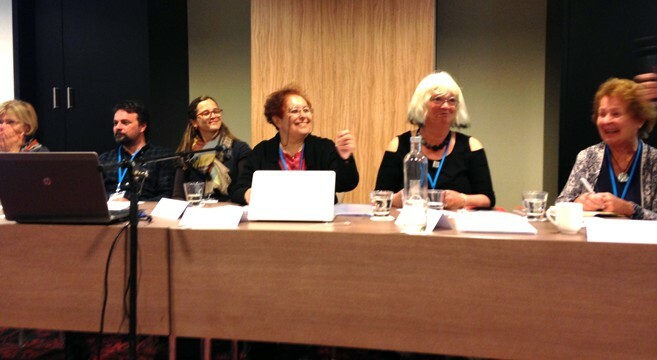 Report from 5 days at the 17th ETN Conference in Leiden, Netherlands 13 - 17/5 2015. Board member of NTA, Ella Ekman, Josabet Werkmäster and myself, were impressed of a fantastic program. Beyond the ETN conference there were textile exhibitions in Leiden of Dutch textile Art, Craft and Design in the framework of the 4th Textile Festival in Leiden and the Rijswijk Textile Biennial. The program of the ETN conference consisted of 3 days, before that, there were 2 pre-programs, and one of them was a workshop held by Vibeke Vestby from Norway: Working with the TC2 Jacquard loom, this workshop was held at the Textile Museum in Tilburg, one hour away from Leiden. Before the conference we had booked a pre-program;a daytrip to the Textile Museum, with a guided tour. One specialty of the museum is that they produce artwork: woven, tufted and printed textiles to artists all over the world. The museum has also a great collection of historical textiles a library and a museum shop. Close to the museum is the Museum De Pont, a modern museum in a former spinning mill, with a fantastic collection of modern art, such as a carpet made of pollen from pine, made by the artist Wolfgang Laib from Germany, and the installation with beeswax also Wolfgang Laib and a few artworks of Anish Kapoor. The following day, also before the conference, there was a trip to Amsterdam on the program. We started our visit to look at the new Amsterdam Library, already at the entrance we were impressed by a textile wall covered with silk wall-hanging and on the floor ”carpets” made of printed glass. From the top balcony and restaurant we had a marvelous view of Amsterdam. Next we were attending a boat tour on the canals of Amsterdam under several bridges. It was during holiday season, so Amsterdam was crowded. In the evening we went back again to Leiden. On the Friday, ETN had the General Assembly, were I was elected as a member of the board. Other members of the ETN board are: Lala de Dios from Spain, President, Patricia Christy, from United Kingdom leader of the TEXERE Working group, an organization worldwide for textile teachers. Andreas Selzer secretary, and Kristina Leitner ordinary member and Vibeke Vestby treasurer. In the afternoon we went to the Pieter’s church, where we got a guided tour. The whole church was used as an exhibition hall for the Textile festival of Leiden, and work by members of the national textile organizations were on show. We also made a tour in the city and among others we visited the Japanese museum Siboldhuis were we saw Silk Splendor Kimonos, Japanese perfection in silk. At 17.30, buses took us all to the Rijswijk Textile Biennial, 20 artists from 12 countries, where Raija Jokinen from Finland, Ane Henriksen from Denmark, Kari Steihaug from Norway and Ida – Lovisa Rudolfsson from Sweden were on show. At the end of the day we were all served a Dutch-Indonesian Rijstafel outside in the garden. On Saturday, the first day of the conference program, seven different speakers were talking about Dutch Textile Design. First out was Ingeborg de Roode, curator of industrial design at Stedelijk Museum of Amsterdam. She held a very interesting lecture about their textile collection. The museum has 275 pieces of textile art, a great number of textiles from Bauhaus and a big library of textile art and design. After that Joke Robaard, theory tutor from Rietveld Academy Amsterdam “Textile and Text”, held a philosophical speech about teaching design today. After that we listened to a lecture from Hebe Verstappen, Textiell Lab at the Textile Museum of Tilburg, about a working place for research and experiments. She spoke of a specialized workshop and a laboratory for producing woven and knitted fabrics, prints, embroideries, tufted works and passementerie. Designers, artists, students and companies can come here and are assisted by project developers and technical experts. The Textile Museum is more than a classical museum; it’s a place for innovation for the future! After that Buro BELÈN, Lenneke Langenhuijsen and Brecht Duijf, 2 young Dutch designers were telling us about one of their projects on interior textiles, made out of wood from Java. Beating bark is an ancient handicraft and one of the earliest methods of making textiles. After lunch Barbara Broekman was showing lots of large-scale textile commission in buildings in Amsterdam and all around the Netherlands. After this 3 more speakers were lecturing, it was nearly too much! At the end of the day all of the members met and had dinner at the hotel Golden Tulip. Anne Marie Woerlee started the lectures on the Sunday, she was talking about textiles from the Rijksmuseum in Amsterdam. Maria Friend from Australia was talking about colonial Inspiration: batik textiles and the Dutch art. After that Loan Oei, textile researcher, was talking about ”From Spider Web to World Wide Web” - Textiles Matters in History, a very interesting lecture! After coffee break 4 more lectures were held. and the ETN, Borås textile Museum and NTA and TEXERE meeting 2017 in Borås Sweden. A Post Conference on Monday visit to Dutch Folklore, a visit to North Holland to Zaanse Schans. Or in Leiden, Bio Textiles Symposium organized by the association of Dutch Textile curators. And the following day a visit to Antwerp Leuven, Belgium and the company Materialise to see 3D, were haute couture is created, for example Iris van Herpen. Then a visit to Antwerp Fashion Museum. You could also visit Stedelijk Museum in Amsterdam on a guided tour. //Elisabeth Brenner Remberg, chairwomen of Nordic Textile Art and new board member of European Textile Network.